Derek Boogaard's Family Sues NHL Over Player's Death In 2011 : The Two-Way A wrongful death lawsuit has been filed against the NHL by the family of hockey enforcer Derek Boogaard, who was 28 when he died from an accidental overdose of alcohol and oxycodone in May of 2011. The suit accuses the NHL of being negligent and with supplying the painkiller to Boogaard. The family of Derek Boogaard, who died in 2011, has sued the NHL, accusing the league of negligently causing his death. 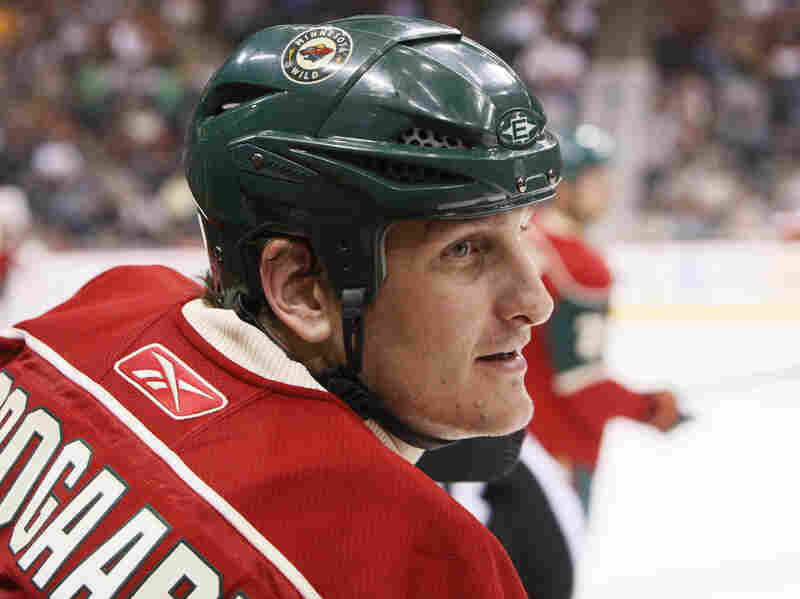 A wrongful death lawsuit has been filed against the NHL by the family of hockey enforcer Derek Boogaard, who was 28 when he died from an accidental overdose of alcohol and oxycodone in May of 2011. The suit accuses the NHL of being negligent and with supplying the painkiller to Boogaard. "The NHL drafted Derek Boogaard because it wanted his massive body to fight in order to enhance ratings, earnings and exposure. Fighting night after night took its expected toll on Derek's body and mind," attorney William Gibbs said in a statement after filing the suit. "To deal with the pain, he turned to the team doctors, who dispensed pain pills like candy. Then, once he became addicted to these narcotics, the NHL promised his family that it would take care of him. It failed. He died." Boogard's parents, Joanne and Len, donated Derek's brain to researchers at Boston University, known for its focus on sports-related brain and head trauma. They found early signs of chronic traumatic encephalopathy, a neurodegenerative disease linked to repeated brain trauma. Drafted by the Minnesota Wild in 2001, Boogaard joined the team in 2005; he later played one season for the New York Rangers. He missed several months of his final season due to injuries. "He also reportedly participated in 174 career fights in professional hockey," Boston University researchers said, a figure that includes Boogaard's career before reaching the NHL. He is believed to have fought more than 60 times while in the NHL; he scored three goals in the league. Boogaard had been in a substance abuse recovery program run by the NHL and the players' union, according to The New York Times. In representing the Boogaard family, Gibbs is joined by fellow attorney Thomas A. Demetrio; the pair "also represent the family of Chicago Bears great Dave Duerson and other NFL players in lawsuits against the league stemming from concussions and CTE," according the their law firm's website. The lawsuit comes weeks after the Boogaard family's lawsuit against the NHL Players Association was dismissed, the AP reports. That suit, filed last autumn, sought $9.8 million in damages.